Matches will be played at the Pequot Lakes High School Athletic Center and Middle School Gym (all gyms are located in the same building). This is a first-class facility with full-size courts, plenty of bleacher space for spectators, an elevated walking track to watch the games from above, and a full-service, well-stocked concession stand. 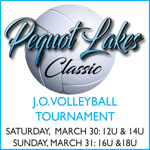 Register your team for the Pequot Lakes Classic JO Volleyball Tournament today!